One of our most popular winter wedding favors! Add an elegant touch to your winter wedding with our one of a kind snowflake wine stoppers. Each favor is made from sturdy chrome and features a rubber gasket and beautiful three-dimensional snowflake design on top. Favors measure 4 1/2" x 1 1/2" x 3/4". Bottle stoppers come individually wrapped in a deluxe box with a clear top and black, snow-flake decorated bottom. Each one is tied with a white sheer ribbon and includes an attached snowflake design thank you tag. Looking at snowflake wine bottle stops - says these are 'made of chrome'. That doesn't make sense .. Are they metal or plastic? 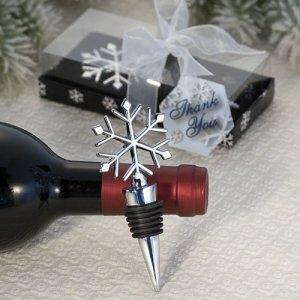 The Winter Snowflake Chrome Bottle Stopper Favor is made of metal.